Line a baking tray (30cm x 26cm) with baking payer, leaving a slight overhang. In a large bowl, place the rice pops, rolled oats, goji berries, shredded coconut and chia seeds. Using a spatula, stir to combine and set aside. Place a quarter cup coconut oil, peanut butter and honey in a microwave safe bowl. Set on high for 20 seconds. Remove bowl and stir mixture. Then heat for a further 10 seconds if required. Remove from microwave and pour over dry mixture. Add in frozen berries and using a spatula, stir to coat thoroughly. Transfer into baking dish. Spread mixture evenly into the dish and press firmly with spatula. Place in fridge for 1 hour to set. 5 minutes before removing the tray from fridge, break up the white chocolate and place in microwave safe dish. Cook on high for 30 seconds. Remove, stir mixture then heat for a further 20-30 seconds or until chocolate is melted (be careful not to overheat). Drizzle chocolate over muesli slab. Allow to set for 5 minutes. 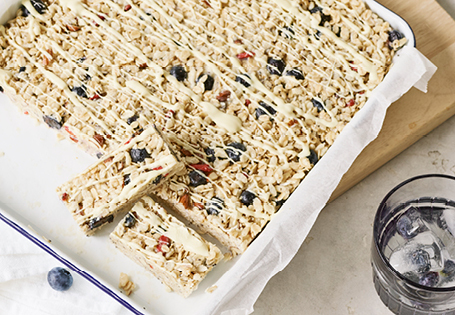 Remove muesli slab from tray and place on chopping board. Using sharp knife, slice into desired bar size and serve. Note: Store remaining bars in the fridge in an airtight container.